Monday, December 11, 2017 from 12:00 - 1:00 p.m.
An engaging ethics CLE on recent changes to the Oregon Rules of Professional Conduct relating to advertising. 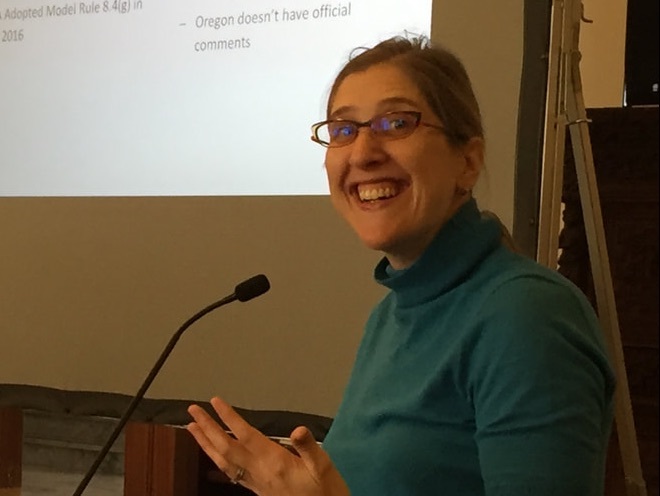 During this interactive presentation, Amber Hollister, General Counsel for the Oregon State Bar, will discuss the work of the OSB Futures Task Force, and developments in the regulation of lawyer advertising and client solicitation. Today’s lawyers engage with prospective clients on social media, through online referral services, in client-lawyer matching marketplaces, as well as in more traditional forums. How can an ethical lawyer navigate this brave new world? How does our regulation of attorney advertising and solicitation impact access to justice? Bring your curiosity and perspective to this conversation about the future of our profession. ​1.0 ethics CLE credit were approved. See materials below.